antibiotics would do me no good. The plan was that I’d get called for investigative surgery, then corrective surgery, then a different kind of corrective surgery if the first didn’t solve the problem. Apparently it could take a year, in all. The surgeon recommended I lose weight in the meantime as it would reduce my risk of complications. I just got home from this appointment when I got a call from the fertility clinic. There had been a cancellation. I took the appointment and travelled back to the hospital the next day for a series of tests after which I was told to come back in six months, five stone lighter. If I didn’t lose the weight, they wouldn’t be able to treat me. 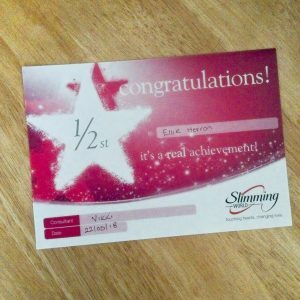 The first of May, I rejoined Slimming World (having done it once before and previously lost four stone which I’d managed to put all back on). I’ve been plugging away at that for a full month and have lost eight pounds so far in total. Also in that time I’ve had a preoperative assessment and received another referral letter, this time for urology. I asked my GP why urology want to see me and she didn’t know. It’s apparently not in my notes. Hospital referrals are stored on a different system. Hopefully all of the cyst stuff gets resolved in under a year, because nothing can really be done about the fertility side of things until it is and treatment for that can apparently take a year itself. Truly, I am learning what it means to be patient. Note: There has been an update since this was posted. See here for part two.